Nokia (HMD Global) re-entered the mobile arena with the launch of Nokia 6, Nokia 3, Nokia 5 and Nokia 3310. In fact, Nokia announced these during the Mobile World Congress in Spain, back in Feb 2017. And now again after two years, the company has unveiled its latest Flagship at the MWC 2019, in Spain. Bizzare it may sound, but it is true that Nokia has gone with a Penta-Lens (5 Rear Camera) setup on the latest flagship. Previously, Samsung has launched the Galaxy A9 in India, with 4 Rear cameras. If that was not enough, Nokia has added 5. Notably, It is the first phone in the world to have 5 rear cameras. At the back we can see 7 camera holes, one is flash, second is nothing and rest 5 are cameras. Are so many cameras on the Nokia 9 a gimmick or does they have any use? Nokia 9 Pure View has three 12 Megapixel monochrome cameras and 2 two RGB 12 MP cameras. The Zeiss certified lenses have an aperture of 1.82 (all the 5 lenses). The three monochrome cameras are meant to capture more light and details in an image, the colors and vibrancy are captured by the 2 RGB cameras. When you click the camera button to capture an image, all the 5 lenses capture an image which is later merged by the Image Signal processor to form a high resolution final photograph. 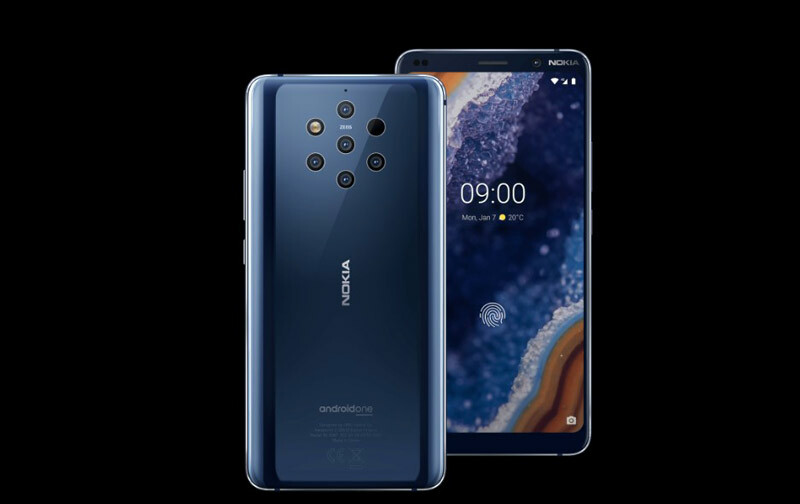 Nokia also said that they have fully utilized the prowess of the SD 845 Processor to make the cameras work better and they have even collaborated with Google and Qualcomm to optimize the cameras further. Conceptually, the Nokia 9 approach looks smart, but we will have to wait for real-world results. It is not a new approach, Huawei has used the RGB and Monochrome sensors in many phones including the camera crown P20 Pro. The camera interface is also optimized and suited to the Penta-lens setup and comes with features like special monochrome shots and a Pro mode. Further, at the front there is a 20 Megapixel camera to click selfies. Powering the Nokia 9 preview is a year old Snapdragon 845 Octa-Core processor and the Adreno 630 GPU. Since most other flagship phones (Mi9, Samsung S10, LG V50, G8) are coming with the latest SD 855, it looks like a back step for the Nokia 9. Camera enthusiasts may still buy it but performance junkies will opt for the latest flagship chipset. Furthermore, it has 128 GB of internal storage and comes with 6 GB of DDR4 ram. Besides, the Nokia 9 comes with the stock Android 9.0 Pie from Google and is part of the Android One program. The key benefit for the Nokia 9 is going to be timely software updates from Nokia, as it will get Android Q and even the Android R.
The Nokia 9 looks like a head turner if those 5 cameras at the back can’t get attention, then what else can. There is glass back design, and the front side has a more conventional no notch design. There are still some bezels up front, if we compare it to the Galaxy S10, otherwise it is acceptable. The phone comes with an immersive 5.99-inch Quad-HD+ (2960*1440 pixels) POLED display with 18.5:9 aspect ratio. The display is protected by the Corning Gorilla Glass 5. Also, it has the voguish in-display fingerprint scanner. The smartphone comes with a moderate sized 3320 mAH capacity battery that supports fast charging as well as wireless charging. Additionally, it comes with USB Type C port, Water and Dust resistance (IP 67 rating), Bluetooth 5.0, NFC and WIFI support. Unfortunately, there is no 3.5 mm headphone jack and you will have to use wireless or USB type C headphones. Nokia 9 is available from March 2019 in only one variant and blue color option. The price is USD 699 or Rs. 49,700. We will update the exact date of launch of the device in India soon.